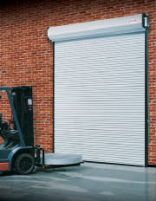 Also called Overhead Coiling Doors, Rolling Steel doors are typically used in Commercial applications where heavy use is demanded and headroom is restricted. Rolling Doors can be mounted both inside and outside the doorway. They can either be insulated or non-insulated; Rolling Grilles are similar except aluminum links are used to make a curtain instead of slats. Used in Shopping Malls for security, Grilles are increasingly being used as car park gates because of their small footprint. Overhead Coiling or Rolling Steel Doors, Fire Doors & Commercial Sheet Doors.